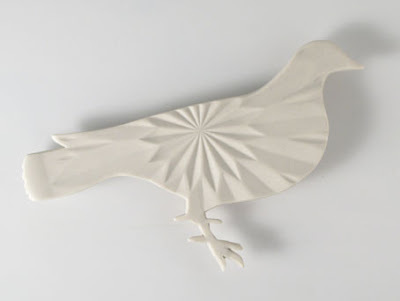 A couple of weeks ago I posted a picture of a white porcelain pigeon I made (and here's another little one above). There’s quite a lot of pigeons, in various forms, in this upcoming show of mine. My nana’s second husband was a pigeon fancier, and during the Second World War he served in New Guinea in the Australian Corps of Signals Pigeon Service looking after the messenger pigeons. There are some incredible stories surrounding the feats of these little birds in World War Two, some of them even being awarded medals of bravery after surviving against incredible odds (exhaustion, tropical storms, being shot down by snipers, attacks by hawks and falcons) to deliver messages that sometimes resulted in saving the lives of hundreds of people. Clever little birds. As kids we used to climb up the wonky narrow steps to his huge pigeon loft and peer in at the cooing (and stinky) birds, and a shelf in my nana's lounge room was packed high with shiny golden pigeon racing trophies that he had won over the years! We always thought his obsession with them was just a little bit strange, but the more I read about these little critters, the more I can understand his fascination! Kamenendo and I were having a cuppa at Bum Crane’s house a couple of weeks ago when in flew this little beauty. 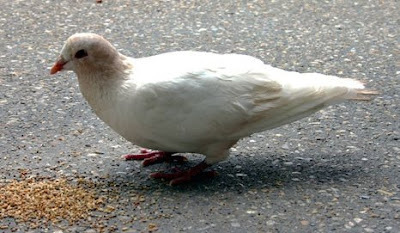 I’ve never seen a white pigeon before, and it was kind of spooky she flew in just after I’d made one. I’m thinking I might make a big porcelain pot of gold next…you never know what might turn up!! I am liking the pigeons, but the pot of gold most definitely needs to be made!